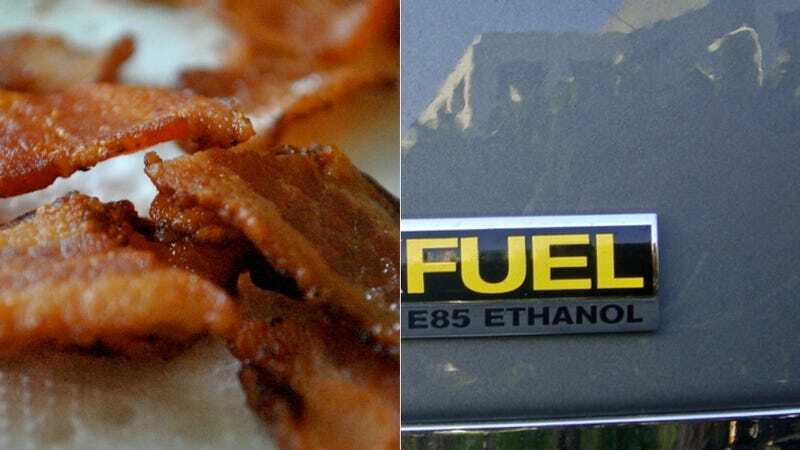 How Can Ethanol Fly In America If It Negatively Affects Bacon? I've stopped going to Subway and my quality of life has improved. It used to be convenient, but it was terrible. Nothing grew more irritating than standing in line with a bunch of exhausted looking people waiting for a sandwich assembled with such disinterest. And once you'd picked your bread, someone would ask me, "Would you like to add bacon to your sandwich?" Bacon is great, but I don't need a depressing-looking slab of it covering an Italian BMT. And for more money, mind you. It's a similar situation with ethanol. E85 has failed to capture much attention from most drivers. E15 has been pushed on cars with corrosive effects. Ethanol is being pushed and pushed and it's not looking any better. In fact, more and more research is showing it has damaging effects on cars and the environment and wasn't totally checked out before the EPA gave the OK to E15. Is Ethanol Just A Well-Marketed Disaster? I have the best argument against ethanol: it makes bacon more expensive. When the ethanol craze first started a few years ago, it caused corn prices to skyrocket. Corn is the primary ingredient in feed for pigs (and other kinds of livestock) and feed is a pork farmer's biggest expense. Therefor ethanol is bad because it takes away from food production, which is already a big enough concern worldwide. We shouldn't hurt such an essential industry just to ease our first world fossil fuel dependency, but mostly because I want cheap bacon, damnit! This is how to successfully tie bacon and ethanol together. Sometimes it's good, great even. But a really good idea would be to actually try it on all your sandwiches before you start telling everyone it goes together well.